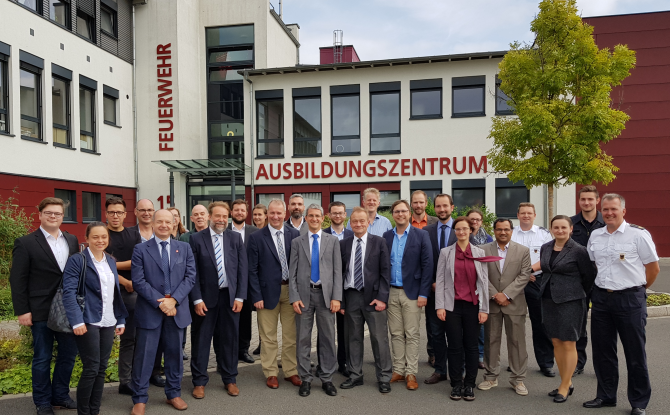 The final review meeting of the European research project EmerGent (Emergency Management in Social Media Generation) took place on September 7th,2017 at the Dortmund Fire Brigade’s training centre. During the runtime of the project, the ten project partners have investigated the positive and negative influence of social media on emergency response. In addition to the presentation of significant research results, a live demonstration of the EmerGent IT system was held on the training grounds of the Dortmund Fire Brigade. The project’s results have been published in a variety of scientific publications and reports and presented at numerous conferences. All public reports and publications can be found in the publications section of our website. Deliverable 2.4 and Deliverable 6.4 have been finalized and published today. Find it in the Publications section of our website. Deliverable 2.4 presents evidence from a recent round of surveys exploring citizens’ and emergency service staff’s attitudes towards and use of social media in general and in emergencies based on online surveys conducted between November 2016 and June 2017. Also it explains the ‘multiple case study’ methodology of the previous case study rounds. Finally, it summarizes the main conclusions from all five rounds of case studies and the surveys. In Deliverable 6.4, we present two iterations of evaluation of our concept, which has been implemented as a prototype for emergency services. Deliverable 7.8 has been finalized and published today. Find it in the Publications section of our website. It describes the continuous monitoring of relevant laws regarding the usage of data, and provides a summary of our findings to date. It also gives information about measures that will be in place to prevent improper use or disclosure of the data, as well as ensuring forensic readiness of the EmerGent system. Another two deliverables have been completed by the EmerGent consortium and can be reviewed under the Publications section of our website. Deliverable 7.2 describes dissemination and marketing campaigns in order to spark interest in EmerGent, the EmerGent Mobile App 112.social and EmerGent’s stakeholders. Deliverable 7.3 summarises the findings and conclusions of EmerGent in the form of guidelines for end users for increasing the benefit of social media use during emergencies. It provides a list of recommendations for emergency services and citizens on how to make the most of social media use, explore and benefit from the opportunities offered and take the necessary steps to achieve a smooth and beneficial use of this medium. Deliverable 2.5 has been finalized and published today. Find it in the Publications section of our website. It describes how end-users have been involved in EmerGent. Furthermore, it shows results on citizens’ perception of social media as well as the results on a study on the distribution and user of crisis apps.. In Deliverable 2.7 you can find details and about EmerGents third workshop. Deliverable D4.5 is about Information Quality in social media before, during and after emergencies and Deliverable 6.3 contains the results of our second validation of the EmerGent IT-System. Two new deliverables have been finished by the EmerGent consortium. D4.8 describes the implementation of the Processing and Analysis Subsystem (PAS) of EmerGent, which contains the data enrichment, information mining (IM) and information quality (IQ) components. This document expands on D4.6 by describing how the designs therein have been incorporated into a live system. It describes a processing pipeline based on association of components by a simple standard RESTful interface as well as a controller that coordinates the operation of the pipeline. The input of the system is a batch of messages collected from various social media channels. The output will have been filtered to improve relevance and augmented with useful information on the quality of information supplied. The system is intended to be used alongside a user interface component that presents the results of processing and allows the parameters of the processing pipeline to be altered. D5.6 as a technical document provides an updated version of implementation and verification activities performed after D5.5 publication. The main components of the EmerGent IT system analysed in this document are the EmerGent Mobile APP (EMA) and ES interface (ESI), even if additional components such as the Dissemination Service (DS) and the Processing and Analysis Subsystem (PAS) are briefly described to explain how they interact with EMA and ESI.